The 50,000 Happy Birthdays program, developed by the International Confederation of Midwives and funded by Laerdal Global Health, focuses on improving quality of care for women and newborns on the day of birth in Ethiopia, Rwanda and Tanzania using a simulation-based learning approach. Using the Helping Mothers Survive modules created by Jhpiego and the Helping Babies Survive modules created by the American Academy of Pediatrics, capacity is being built through local midwifery associations to save lives through both pre-service and in-service education of midwives. The HMS Secretariat has partnered with ICM and Latter Day Saints Charities to facilitate training workshops for the midwifery associations in all three countries to develop a pool of quality Master Trainers. The HMS Secretariat continues to provide technical assistance to the midwifery associations in each of these countries as they move forward to scale up the implementation of these life-saving modules in their countries. Get Involved: Knit a Hat for a Newborn! 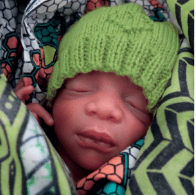 In addition to supporting ICM and country midwifery associations to the HMS modules, Jhpiego has joined the 50,000 Happy Birthdays knitting campaign to provide at least 5,000 spring green newborn hats. These hats will give life-saving warmth for newborns at the moment of birth. This is just one small way you can support the tireless work of the midwives in each country to help save lives. Every hat you knit and donate will help a newborn in a low-resource setting stay warm, and contribute to their “Happy Birth-day”!